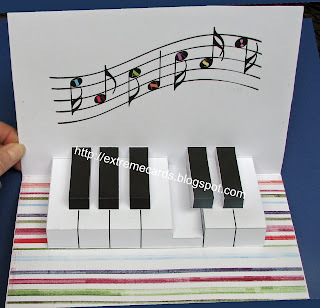 You may remember a pop up card from way back, the seven flower pop up card. I've done a couple variations of it including a three flower daisy version. 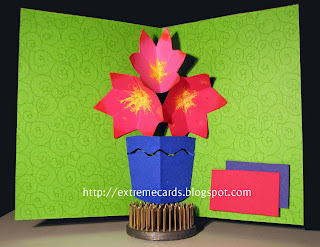 This card has three flowers in a triangle arrangement, with a pop up vase below them. I finished the front but left the sentiment space blank on the inside. 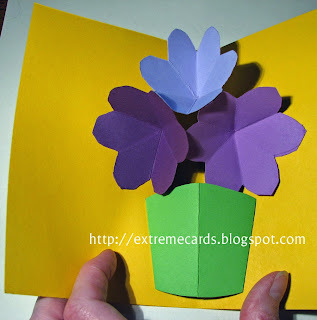 Here's how to make this three flower pop up card with vase. 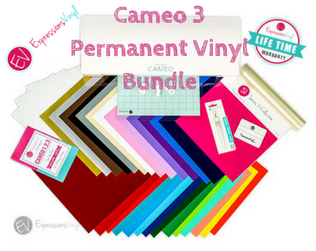 You can use the cut file, or hand cut them from 3" squares following the instructions from the beginning of this video. Reshape the petals if you wish. 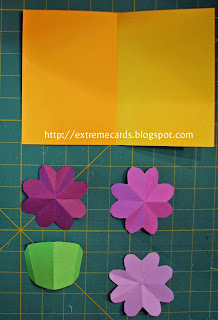 Create cupped flower by removing one petal (already done for you if you're using the cut file), and overlapping and adhering the two petals on either side of the cut-out. Flatten flowers and arrange as you want them above the vase. 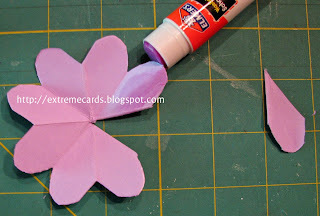 I use 1/4 of a round glue dot to adhere the petals together. 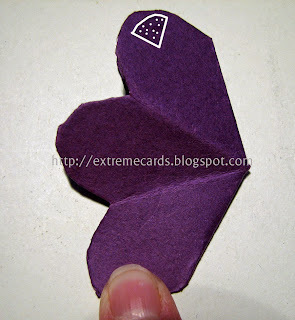 You want just a dot of glue at the very tip of the petals where they will join. 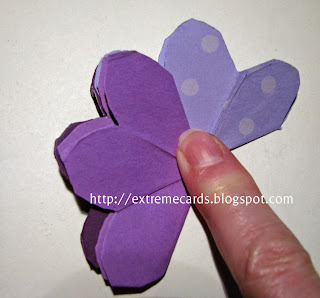 Apply adhesive to the tip of the top petal of the left-hand flower. 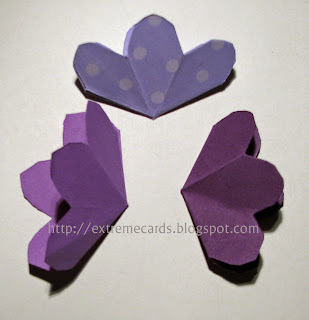 Place the center flower on top of the left-hand flower, aligning the left petal of the (light purple) center flower with the top petal of the (dark purple) left-hand flower. 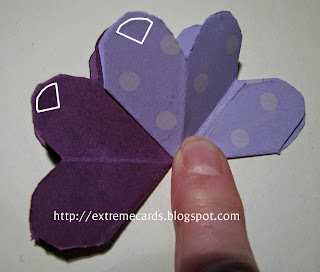 Apply adhesive to the left petal of the (light purple) center flower and the center petal of the (dark purple) left-hand flower. 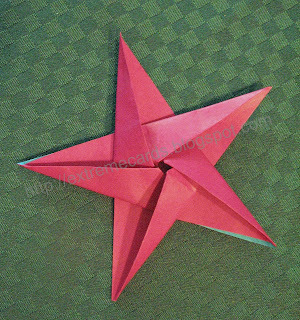 Place right-hand flower on top of the other two flowers, aligning it with the left-hand flower on the bottom of the flower sandwich. When you open the flower sandwich it looks like this. 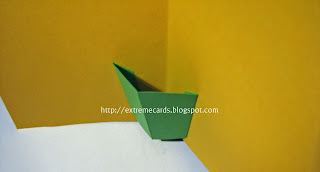 Set the flowers aside while you adhere the vase to the base card. 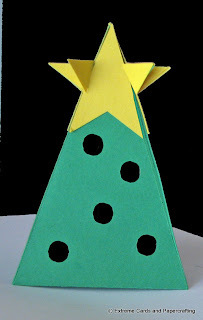 Fold the vase piece along the center crease line. 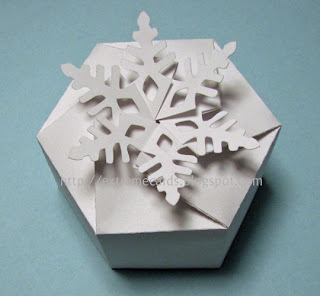 Fold the tabs to the outside of the vase. 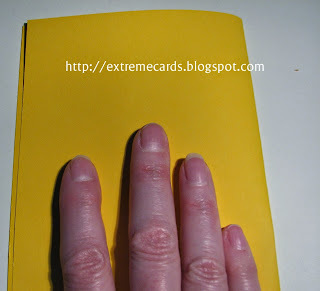 Push the center crease of the vase into the center fold of the base card. 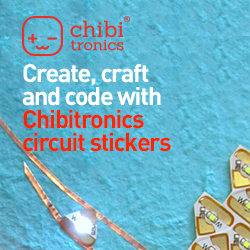 Apply adhesive to the long tab that is visible. 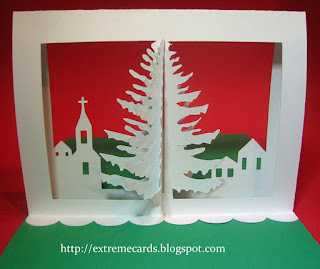 Close the card, flip it over, open the card. Apply adhesive to the other long tab. 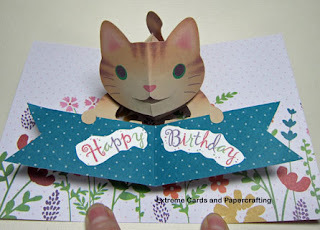 Close the card to adhere. Now add the flowers. 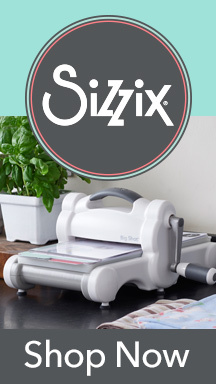 This is the tricky part! 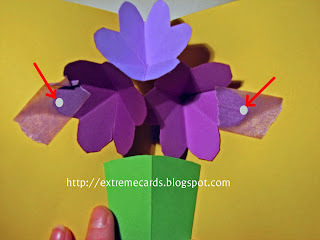 The bottoms of the side flowers must be able to clear the top of the vase as they pop up, and the top flower needs to nestle into the center fold of the base card when the card is closed. 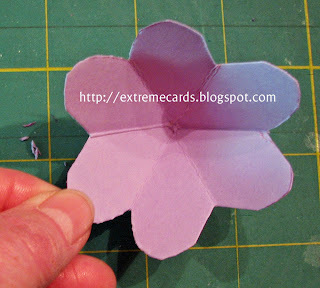 Start by laying the flower sandwich on the card, with the edge of the (light purple) top flower just at the fold of the card. No part of this flower can cross the center fold. 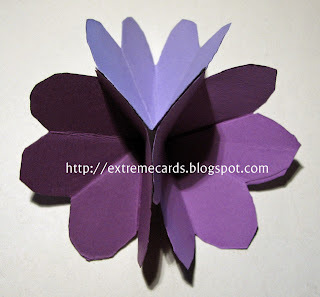 The fold on the top flower (down the center of the light purple heart) should be perpendicular to the center fold of the base card. The lowest hanging part of the (dark purple) side flowers must be above the top of the vase. This photo is flipped to the other side, but it shows the correct placement of the flower sandwich. 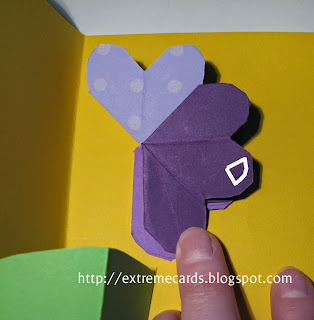 The flower sandwich will be attached to the card, with just two dots of adhesive, at the tips of the center petals of the right-hand and left-hand flowers. 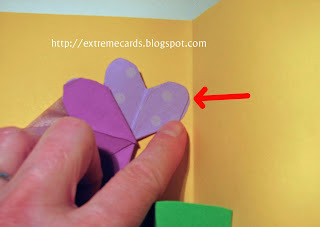 The grey dots indicate where you will put the glue on the back of the petals. For now, put some painters' tape (low tack tape) on those petals to try out your flower placement. 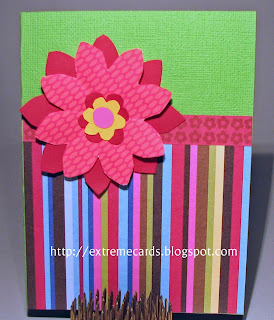 Test your placement to make sure the flowers open and close properly as the card is opened and closed. 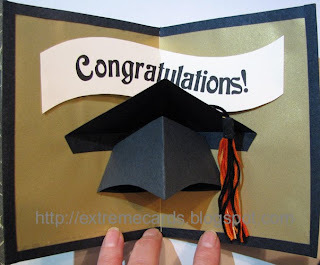 Once you are satisfied with the flower placement using tape, close the card. 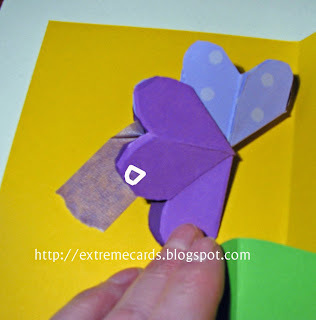 Partially open the card and remove one piece of tape, being careful not to move the flowers. 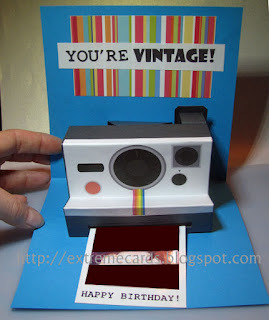 Replace the tape with a glue dot and re-close the card. 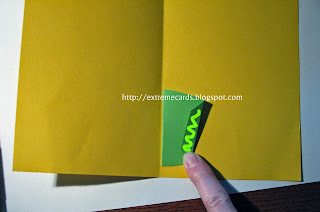 Flip the card over, remove the other piece of tape, replace with glue, and shut the card.